16 Better-for-You Brands. 1 First-of-Its Kind Collection. Target has a storied history of bringing together incredible innovators for unique partnerships, from industry-altering products to design collaborations. 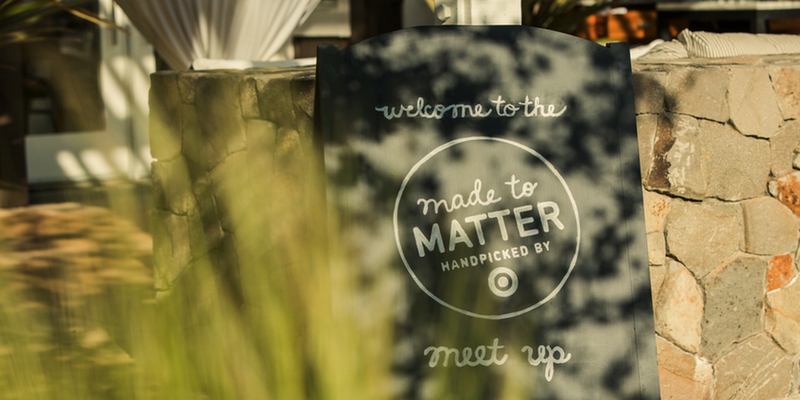 Well, today, Target is introducing Made to Matter — Handpicked by Target, a first-of-its-kind partnership and collection from leading natural, organic and sustainable brands. The new Made to Matter collection will feature more than 120 new and exclusive products from this crew of trusted companies, taking the guesswork out of buying better-for-you products. Hand-picked by Target, the line makes it easy to find products made with simple, recognizable ingredients that you can feel good about bringing home without sacrificing on price or performance. Spanning baby, beauty and personal care, grocery, healthcare and household products, Made to Matter brands include Annie’s Homegrown, Burt’s Bees, Clif Bar & Company, Ella’s Kitchen, EVOL, Horizon Organic, Hyland’s, Kashi, method, Plum Organics, Seventh Generation, SheaMoisture, Target’s Simply Balanced, Vita Coco, Yes To and Zarbee’s Naturals. Target brought together leaders from all 16 brands to enjoy nature at its best and to celebrate this unprecedented partnership. Get to know the great minds behind Made to Matter below. First introduced in Target stores at the end of March, new Made to Matter products will be added throughout spring and summer, with the complete collection available by Sept. 2014. Products will be available throughout the store, both in the products’ usual aisles and as part of specialized collection displays. Select products also will be available on Target.com and Target’s mobile app.